After all the tough talk blasting Wall Street, revolving-door-lobbyists and calls to “drain the swamp” on the campaign trail, President Trump’s cabinet nominees sure are looking like swamp dwellers. From big bankers to a billionaire heiress, Trump’s Cabinet nominees are the wealthiest in US history and combined they have a higher net worth than one-third of Americans. If this alone isn’t a worrisome sign of the type of agenda the Trump White House will prioritize, a deep dive into the background of several his nominees reveals a cabinet with a history of standing against the best interests of working people. 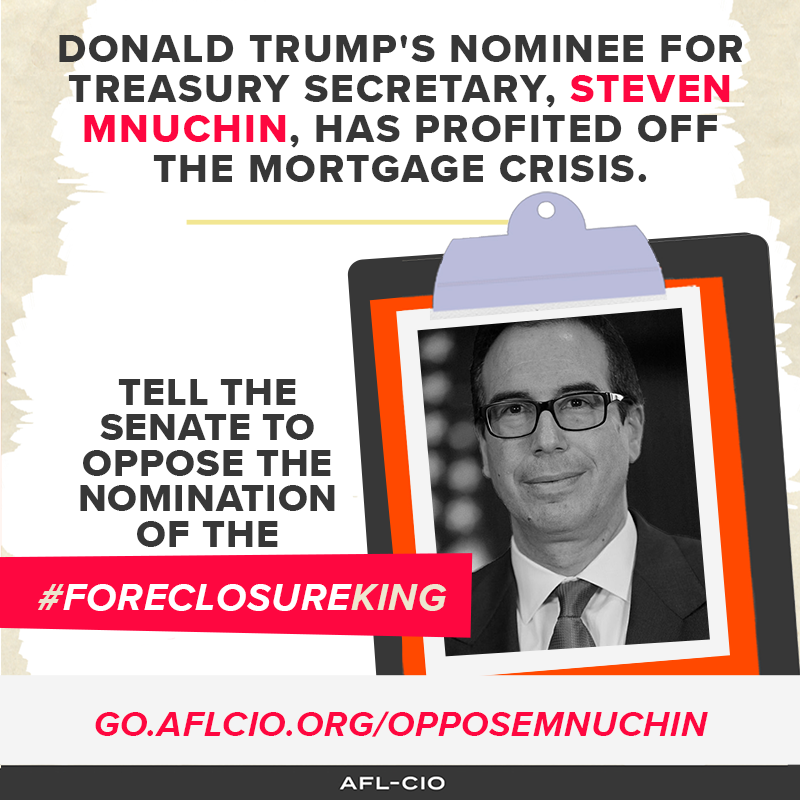 Steven Mnuchin, Trump’s pick for Treasury Secretary helped engineer the Great Recession with his position at Goldman Sachs and then profited directly from it by aggressively foreclosing on struggling home owners. During the nomination hearing process, Mnuchin failed to disclose $100 million in assets to the committee and neglected to mention his position as a director of an investment fund located in the corporate tax haven, the Cayman Islands. Education Secretary nominee and billionaire heiress Betsy DeVos’ only education background is that of being a forthright enemy of public schools. Devos has made a career out of trying to eliminate public education in many states across the country. 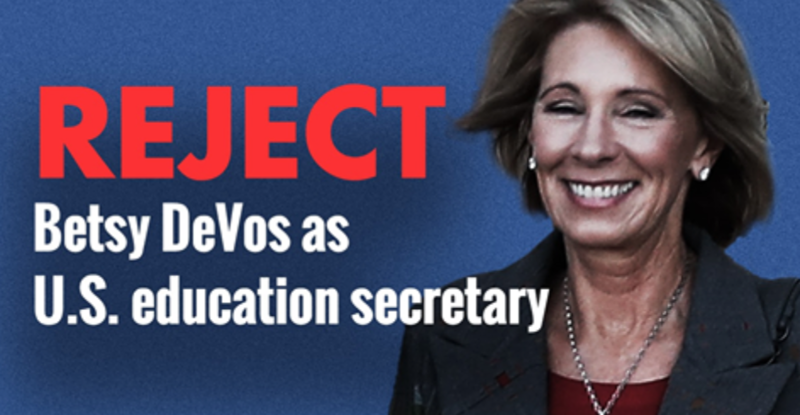 Having never taught in a public school (or at all), served on a school board, attended public school herself or have children in public school, DeVos has been called out by educators and working family leaders as woefully unqualified to serve. 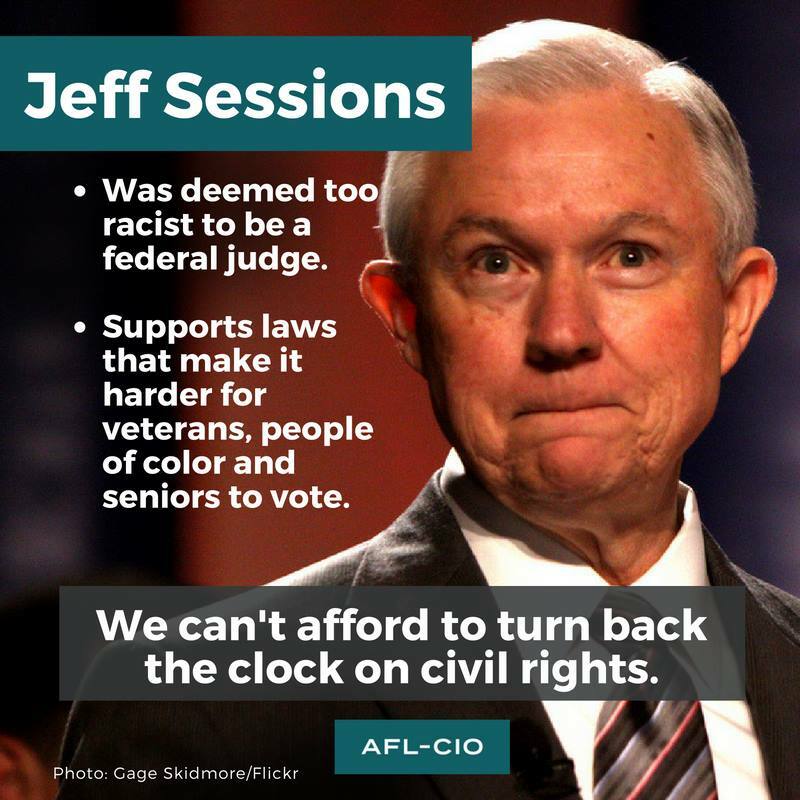 Senator Jeff Sessions, nominee for Attorney General, has a history of racially charged comments and a long record of crushing civil liberties, including the right to vote in his home state of Alabama. His former colleagues testified that Sessions has used the n-word and even joked about the KKK, saying he thought they were “okay, until he learned that they smoked marijuana.” Sessions has also opposed nearly every immigration bill brought before the US Senate for the past two decades that included a path to citizenship. Mnuchin, Devos and Session’s records are troubling to say the least, but working families should pay special attention to Trump’s nominee for Labor Secretary Andrew Puzder, CEO of Hardee’s/Carl’s Jr. (CKE Restaurant). Puzder is a fast food king who has consistently violated federal labor law with his business, vehemently opposes the new overtime rules, rejects efforts to provide paid sick leave and has fought ruthlessly against minimum wage increases. As a fast food CEO, Puzder has shown callous disregard for the welfare of his own workers (who make him record profits) but also a shocking ignorance of the mission of the Department of Labor. Sixty-six percent of women at CKE Restaurants reported experiencing unwanted sexual behaviors at work, compared to 40% of women in the fast food industry overall, according to a national survey. Women working at CKE reported over 1.5 times the rate of sexual harassment reported for the industry overall. Due to severe understaffing in the company, almost a third (28%) of respondents worked off-the-clock. Approximately one-third reported a wide range of wage theft violations, including not receiving required breaks, and overtime pay. Seventy-nine percent of CKE Restaurants workers reported that they have prepared or served food while sick, this is higher than the rate in any of the cities we have previously surveyed. Last week it was announced that Puzder’s confirmation hearing was postponed for the fourth time because the CEO still hasn’t released his financial disclosure paperwork required to show how he plans to avoid conflicts of interests as Labor chief. Do you think Puzder has the best interest of American workers in mind? Can Andrew Puzder be trusted with your health and welfare at work? Can you trust that the Department of Labor under Puzder will stand up to sexual harassment at work? Will you get paid for work that you do and not have the DOL rubberstamp wage theft? Can you trust Puzder with your retirement security and health care on the job? I certainly do not, and I plan on doing something about it. 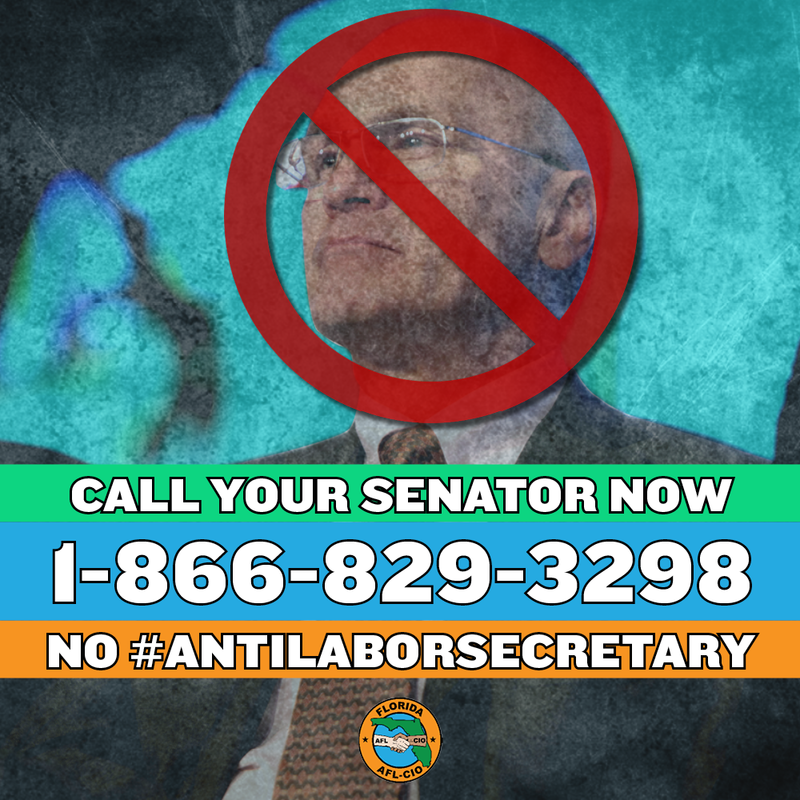 Click here to urge our Senators Nelson and Rubio to reject Andrew Puzder’s nomination for Labor Secretary and the rest of Trump’s billionaire anti-worker cabinet.